They are 6 x 5 inches, folding in half to 3 x 5 inches and feature hedgehogs and mushrooms. I still have some more designs in the works (and I am still longing for some cards bordered with avocado green and little vegetables). In the mean time, feel free to download my design and print them out for free* for your own use. 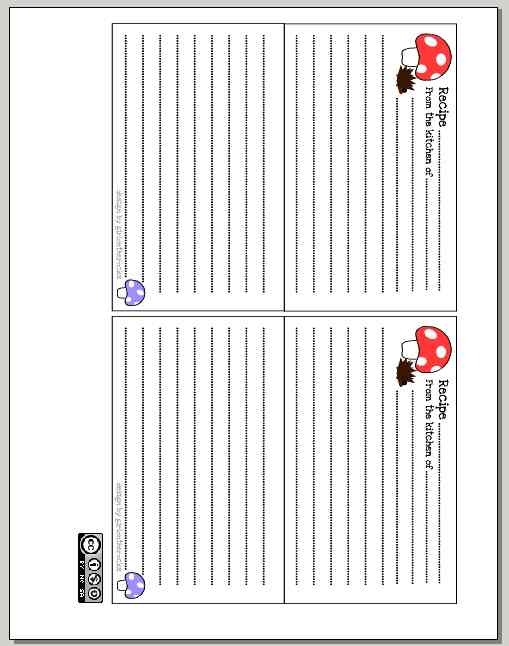 The link below is to a .pdf that will allow you to print out two cards on an 8.5 x 11 sheet of paper (I recommend cardstock for durability). 11 Responses to "Even recipes can be cute"
thank you! these are fabulous. darling recipe cards. i saved the file and hope to print some out, soon. what kind of recipes do you like and i’ll send a few to you? Just like being in a 1970s kitchen! Very cute. I love my recipe cards to be handwritten and on cute cards, too. Most of mine are little pieces of are that are splattered with food. It adds to the character. Thanks for the template. I will come up with a nice recipe for you. Do you want them e-mailed or snail mailed (on one of your cards?). Those cards are cute, nice idea. I love this! I have been so into recipies lately — trying to cook more. I usually just print them out and try to laminate it or put it in a binder but you’re right. the handwritten touch is the best. These are so cute! 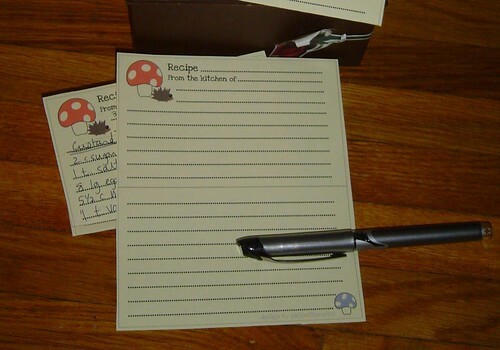 I was just thinking yesterday that I need to write my recipes down on cute cards rather than on scraps of paper/napkins. The mushrooms look kind of like the Super Mario video game mushrooms. I like it! It’s cute! Awww, these are so cute. Thankyou. Thank you for the “double” fold out Recipe Card! These are hard to find and some of my recipes are long so it is nice to have all the information on one side! I too stole cards from my mom! I love sharing recipes and always hand write them out. I mean, if they liked what I cooked?? You bet I’ll share it! Thanks again!